Some tips on how to choose accomodation in Seoul includes proximity to the 24-hour shopping areas, convenience store and subway. Since most trains stop operating before midnight, it is important to be within walking distance to places like Dongdaemun (the place that never closes) or if you like night life, to be close to places like Hongdae (will touch on that later). As for us, being on a tight budget, we chose to stay in a hostel instead. We went to this site (http://www.hostels.com/seoul/south-korea) to source for suitable accomodation based on the ranking system which was a little hard to judge which was better. We settled on TravelersA as we were impressed by the information provided through their website regarding directions and its proximity to two of the subway lines as well as Dongdaemun. You can do an online enquiry and booking through TravelersA website (http://www.travelersa.com/). No deposit is required but you need to tell them your estimated time of arrival at the hostel (factor in about 2 hours after your estimated time of arrival at Incheon airport). After your arrival at Incheon airport, get to the airport limousine counter (located at 1F (same level as the arrival hall), exit 4 and 9). 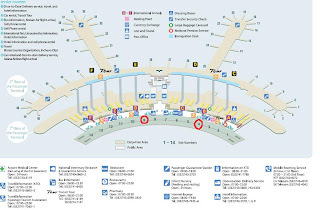 You can get the map from http://www.airport.kr/airport/brochure/brochureList.iia?langGubun=E. Purchase a ticket for bus number 6015 (Myeongdong) which cost 9,000won. Then, the receptionist will give you a ticket and tell you the boarding gate (either 5B or 12A) and the boarding time (interval of every 25min). When you reach the gate, the bus conductor will ask where you are going (which sounds something like Odie kaseyo in Korean). You will have to pass him your ticket and say Gukdo. At every stop, there will be announcement so do listen out for the gukdo stop. Alternatively, you can choose to take the subway (not advisable if its your first time in Seoul and if you are lugging a luggage along). This is because travelling from Incheon to TravelersA (Euljiro 4 ga) requires a transfer. Most of the subway stations do not have lifts or escalators so you have to carry your luggage up long flights of stairs. To travel to the hostel using the subway, firstly, purchase a prepaid card known as T-money from the subway information counter. You just need to tell them T-money which cost 2,500won per card. Then, take the card and head to the reload machine (the card balance amount is 0 at this stage). *Please note that the balance amount in your T-money is non-refundable. You can either use it to pay for the airport limousine (only if you have sufficient amount to pay for the full fare, partial payment using T-money and cash is not allowed) or purchase stuff from any stores located in the subway (only if you have sufficient amount to pay for the full cost, partial payment using T-money and cash is not allowed). We deposited 20,000won into our T-money for a 6 day trip (4 day actually if you minus out the first and last day wasted on the plane). We had about 7,000won leftover and we spent it all in the 7-11 shop. 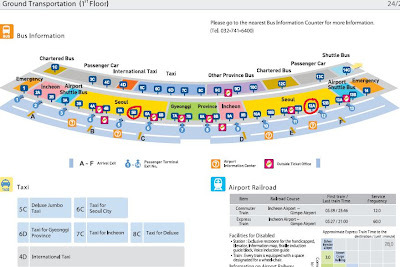 Then, take the airport route subway heading towards Gimpo Int'l Aiport and transfer to line 5 towards Sangil-Dong. Alight at Euljiro 4 ga (pronounced as Euljiro sa ga in korean). The entire journey takes 94min and cost 4,600won. You can get more route information from http://www.smrt.co.kr/Train/Subwaymap/Eng/Subwaymap.jsp. The trains do have reserved seats for elderlys which are usually found at both ends of a carriage. The seats are coloured in red. Avoid those seats as it is deemed rude for you to deprive an elderly of a seat. Korean elderlys are an interesting bunch from what I observed. In Singapore, the elderlys have to try very hard to hint to those sitting to give up their seats to them. However, in Korea, the elderlys will demand for their right to sit. Another point to note is that when the train gets crowded, you will have to push your way through to get out. Expect to get pushed around by people entering the train as well. You can put your belongings on the ledge above the seats so long as you remember to retrieve it when you get down. Food and drinks are also allowed in the trains. Often, you will see Koreans watching live TV broadcast on their handphones in the subway. Take a peek at the screen and you will be amazed by the resolution. An important point to note is that within 30min from exiting the subway, you can ride on the buses with a 900won discount. Similarly, within 30min from alighting from the bus, you can also get a 900won discount from riding the subway. (Basic fare in Seoul is 900won). If you found that you have entered the wrong gantry, do not try to exit the gantry even if that's that station you entered into because 900won will be deducted regardless. You can refer to the map given by the hostel website which I think is not very accurate. We tried to survey the area and found another way to walk there. If you cannot find exit 6, fret not. Just enter any of the exit and look for the correct exit from the directions given in the subway station. If you follow the directions on the map and enter the alley from another end, it is likely that you will see a TravelersA signboard first. Do not be surprised to see that the hostel building is no where in sight. For a moment, we thought the hostel has closed down. Luckily, a couple led the way and walking further up from the signboard, you will see the building on your right. You can walk to Dongdaemun in 10min. In the direction of exit 6 of Euljiro 4 ga, just keep on walking straight till you see exit 14 of Dongdaemun History & Culture Park. You should be able to see the Hello aPM building from a distance (in fact, you can see it from your room) so just walk in that direction. Two lines (line 2 and 5) run through the Euljiro 4 ga station. Line 2 goes to places like Hongdae, Ewha, Seoul National Uni, Sinchon and Jamsil (Lotte World). Line 5 goes to places like Gimpo airport and Yeouido (63 building and where all major broadcasting firms are located). There aren't any appealing restaurants or decent convenience store nearby (within 50m proximity). 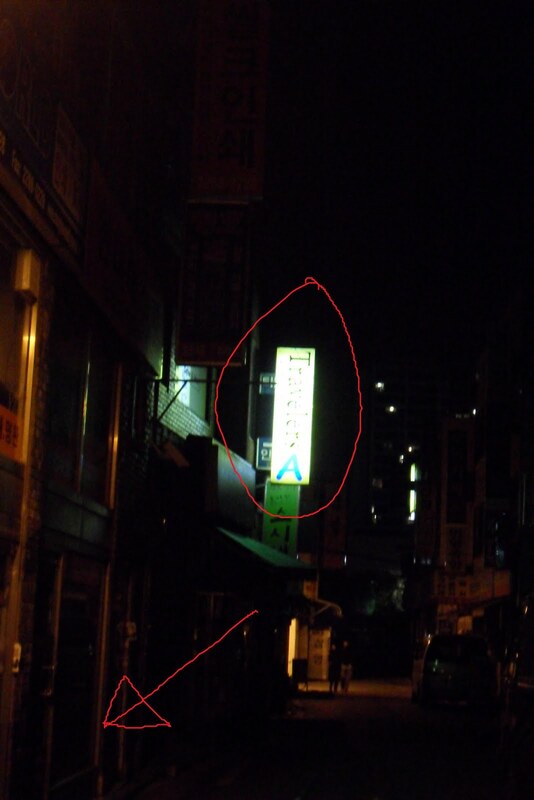 The nearest is probably 7-11 (not 24 hour, closes by midnight) located in the subway station. There is a "family mart" and "buy the way" store across the river from TravelersA. The hostel is located along the Cheonggyecheon river and you can walk to Dongdaemun along the river. There are maps at every exit of the river to guide you. You can cross the river by stepping on the pebbles (I remember seeing this scene in one of the drama). So how do the rooms look like? There's television, fridge and a safebox. *If you need to post any of the information elsewhere, please remember to credit me and show my blog link. Thanks.